Authors of The Bass Book: A Complete Illustrated History, Tony Bacon and Barry Moorhouse, sat down for a live Skype interview with Raul Amador of Bass Musician Magazine. Bass Musician Magazine is a free online bass magazine speaking directly to tech-savvy bass players, gear enthusiasts and industry professionals around the world. The interview covered the idea behind the book and the evolution of the bass. There was discussion of the instrument once being the headliner, but recently has faded to the back becoming more of a footnote. There’s a lot of innovation in the bass from the design to how many strings. What doe the future hold for the bass? The bass guitar is a very seductive instrument, but used properly it can change the course of a piece of music. The Bass Book is the first to study its story, with the full low-down of the most important bass players and bass makers. Brands featured in the book include Alembic, Danelectro, Epiphone, Fender, Fodera, Gibson, Hofner, Ibanez, Lakland, Line 6, Music Man, Peavey, Rickenbacker, Sadowsky, Spector, Squier, Steinberger, Warwick, and Yamaha. The lineup of two guitars, bass, and drums that would define pop music found its heart with the Fender bass. The bass guitar provided the solid foundation upon which much modern music is still built. As Raul suggested in wrapping up this interview, for someone that is into the instrument, this book is great reference on the history. Tony Bacon writes about musical instruments, musicians, and music. He is a co-founder of Backbeat UK and Jawbone Press. Tony’s books include The Ibanez Electric Guitar Book, The Ultimate Guitar Book, History Of The American Guitar, and many others. He lives in Bristol, England. Barry Moorhouse founded the Bass Center, his specialist bass-guitar retail and distribution operation, in London in 1984. Now in its fourth decade, it continues as a worldwide operation. Through his associate company House Music, Moorhouse represents Brian May guitars in partnership with the Queen legend. Backbeat Books’ acclaimed author Tony Bacon has written a new book that will appeal to all vintage guitar aficionados: The SG Guitar Book hits the shelves this month. 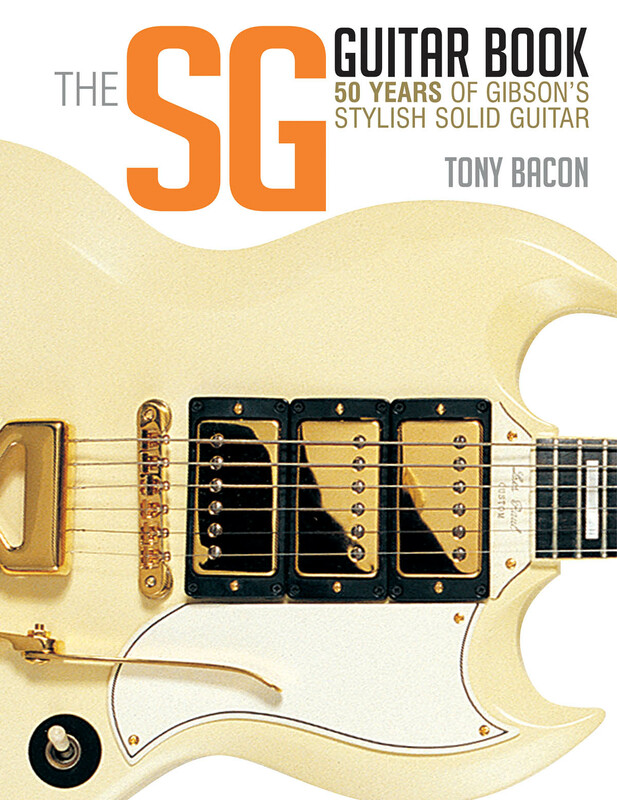 In the tradition of Tony Bacon’s bestselling series of guitar books, The SG Guitar Book is three great volumes in one package: a collection of drool-worthy pictures of the coolest guitars; a gripping story from the earliest prototypes to the latest exploits; and a detailed collector’s database of every production SG model ever made. To many guitar fans, it seems inconceivable that in 1960 Gibson dumped the sunburst Les Paul and, during the following year, introduced a completely new design. We know that design now as the SG – a name that stands, quite simply, for Solid Guitar. At the time, sales of the Les Paul were faltering, and Gibson decided to blow a breath of fresh air through its solidbody electric guitar line. The company described the result as an “ultra-thin, hand-contoured, double-cutaway body.” The modernistic mix of bevels and points and angles was a radical departure, and this new book tells the story of all the SG models that followed and the success of this sometimes overlooked and underrated guitar. New from Backbeat: The SG Guitar Book! The SG Guitar Book is the perfect book for guitar enthusiasts! Tony Bacon, author of the most thorough and readable guitar books out there, tells the story of how the SG came to be. Do you own an SG? Tell us your story in the comments section! To many vintage guitar fans, it seems inconceivable that Gibson dumped the Sunburst Les Paul in 1960 and, during the following year, introduced a completely new design, the one that we know now as the SG (“solid guitar”). Back at the start of the 60s, this made perfectly good business sense to the managers at Gibson. Sales of Les Paul models were faltering, and the company decided to blow a breath of fresh air through its solid body electric guitar line. The company described the result as an “ultra-thin, hand-contoured, double-cutaway body.” The modernistic amalgam of bevels and points and angles was a radical departure, and this new book tells the story of all the SG models that followed: the Junior, Special, Standard, Custom, and more. In the tradition of Tony Bacon’s bestselling series of guitar books, The SG Guitar Book is three great volumes in one package: a collection of drool-worthy pictures of the coolest guitars; a gripping story from the earliest prototypes to the latest exploits; and a detailed collector’s database of every production SG model ever made. In Sunburst, author Tony Bacon explores the origins of the Gibson Les Paul Standard and asks the question: was the Burst really the best guitar ever made? According to guitar greats such as Jimmy Page and Eric Clapton, it sure is! Gibson reached out to Bacon to ask him why the guitar world remains enraptured with the sunburst Les Pauls. Read the whole interview here! Sunburst, from Backbeat Books, is the latest venture in Tony Bacon’s explorations in guitar models and music. Sunburst unravels a myth and puts into sharp focus how 1,400 or so guitars produced at the end of the ’50s became the most desirable electrics of all time. Check out more of Tony’s books here. The Gibson Les Paul sunburst model – the ‘Burst’ – was made between 1958 and 1960, and today it is probed and picked over like no other guitar. That’s because it really is like no other guitar. In fact, as we discover from the musicians, collectors, and guitar-makers found in this book, it may well be the greatest solidbody electric ever made. You only have to listen to the music made with this guitar to realise that it’s a special instrument. Its roots are on Eric Clapton’s Beano album with John Mayall in the 60s and Jimmy Page’s classic work with Led Zeppelin into the 70s; there are its appearances on timeless cuts such as ‘All Right Now’ and ‘Hotel California; and today we hear it bolstering Joe Bonamassa’s worldwide blues-rock success. Many more guitarists have found that the tone and feel of a Burst come together in a magical blend that helps them play better than ever before. The sunburst Standard can be a beautiful object, too. The pictures in this book celebrate the splendour of its figured maple top, each one a unique signature, and reveal the way that the rigours of time can turn the hardest-worked examples into careworn road warriors with a history in every ding and paint-fade. 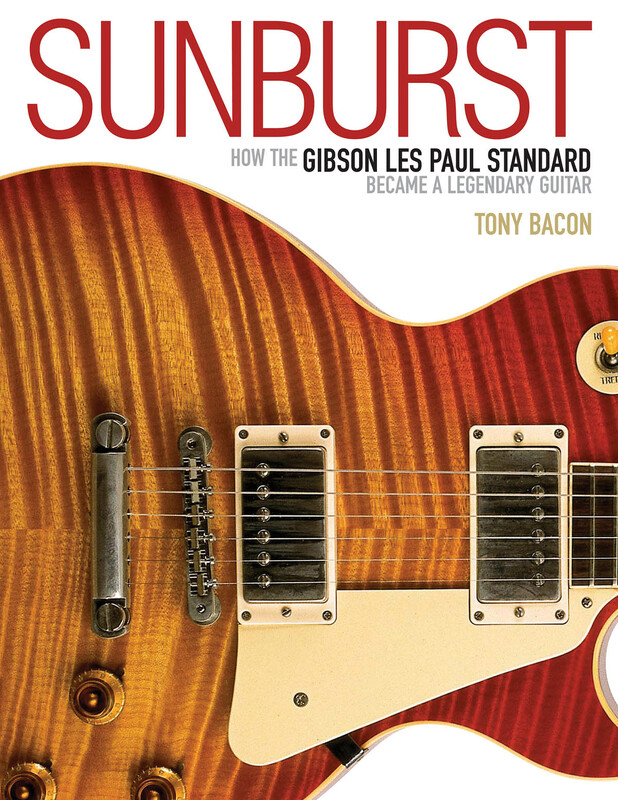 Sunburst is the latest book in Tony Bacon’s bestselling guitar series, with a thoroughly researched story partnered by a gallery of full-color pictures of great guitars, rare memorabilia, and famous Burst players – from Keith Richards to Joe Bonamassa and Jeff Beck to Billy Gibbons. This book shows how Gibson slowly came to understand and more accurately re-create the original Bursts through its reissue programme, under way since the early 90s, and how Gibson’s artist models, limited editions, and collector’s specials have widened the appeal of an already legendary guitar. Sunburst closes with e reference section that provides production details and identificiation clues for every significant model, new and old, of this most enigmatic and revered instrument. Onstage and Backstage podcast from Hal Leonard is available on iTunes and Libsyn. Each episode authors and their guests have a chat about the topics of their books. Today, Tony Bacon, author of many wonderful guitar books including The Telecaster Guitar Book, chats with Richard McDonald and Justin Norvell of Fender about why the Telly is a favorite. This new version of Tony Bacon’s Six Decades of the Fender Telecaster shows how the world’s first commercially successful solidbody electric guitar still attracts musicians more than 60 years since its birth in California. Today, it is more popular than ever and for many guitarists has overtaken the Stratocaster as the Fender to own and play. The Tele is the longest-lived solidbody electric, played by everyone from Muddy Waters to Keith Richards, from Radiohead to Snow Patrol. Its sheer simplicity and versatility are vividly illustrated here through interviews with Jeff Beck, James Burton, Bill Kirchen, John 5, and more. The book is three great volumes in one: a compendium of luscious pictures of the most desirable Teles, a gripping story from the earliest days to the latest exploits, and a detailed collector’s guide to every Tele ever made. Packed with pictures of great players, collectable catalogs, period press ads, and cool memorabilia, The Telecaster Guitar Book is the one Tele book that all guitar fans will want to add to their collection. 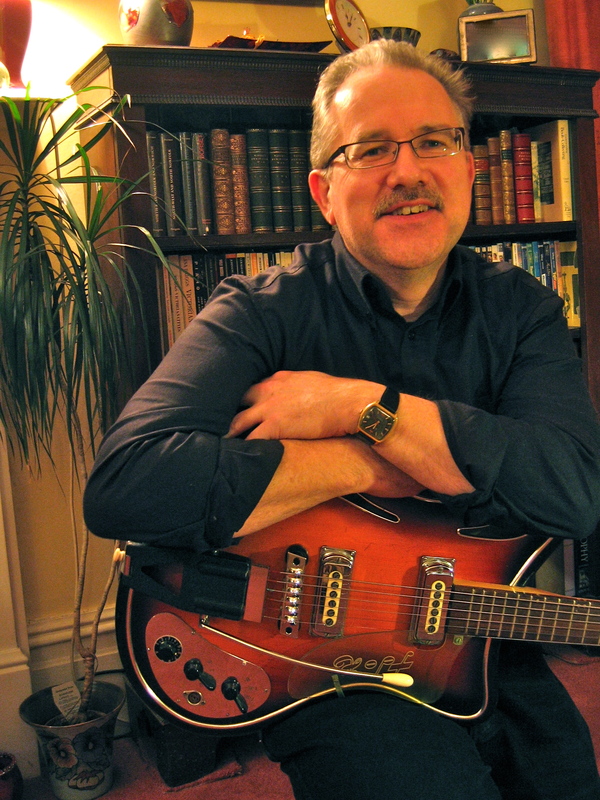 Guest Blogger: Tony Bacon is author of History Of The American Guitar. History Of The American Guitar is my take on 170 years of our favorite instrument, told through a collection of great guitars – from the earliest US models of the 1830s right through to the latest creations of today, and all displayed in beautiful big photographs. It’s a revised edition that we’ve brought bang up to date, and many of the instruments featured were owned by Scott Chinery, photographed before Scott’s untimely death and the break-up of his remarkable collection. This book stands as a tribute to Scott and his passion for the guitar. One of the oldest guitars I’ve ever played was a turn-of-the-20th-century Dyer Symphony Style 8 harp guitar, owned by Scott and which you can see in the book. I picked it up. Carefully. It was a handful, this harp guitar, a result of the expertise of the Larson Brothers of Chicago, who made instruments with various brandnames, including Dyer. It had a regular acoustic flat-top body, but then a huge extra bout that extended upwards, above and parallel to the neck, ending in a curly flourish at the headstock, and with six extra resonator strings attached. So as you played it, that big extra bit of hollow body resonated against your own body. The sound and the experience were extraordinary, like no other guitar I’ve played before or since. It was almost literally as if your body was an extension of the guitar. As I played that Dyer and looked around Scott’s other guitars – we’ve featured 300 or so in the book, and I counted at least as many again in his vast basement – I began to wonder if a guitar can ever be too old to play. I also began to wonder about taking some lessons, but that’s another story. The oldest surviving guitar is thought to be one made about 1590, and experts will tell you guitars or guitar-like instruments go back even further than that. They all disagree about it, of course – that’s one of the main jobs for an expert. Scott had older guitars than his Dyer. His oldest went back another hundred years or so. It was a Stauffer from the early 19th century, made in Germany at the workshop where Christian Martin trained before he emigrated to America. You can see this in the book, too: it’s fragile, small, nylon-strung of course, delicate – and quite playable. And why shouldn’t it be? Herr Stauffer may not have reckoned on it lasting 175 years and more, but why not? Antique furniture can get tougher treatment and might last several centuries more. Many guitars seem to get better as they get older. It’s a pity we’re not the same. In the meantime, I hope you enjoy this new edition of History Of The American Guitar. First published in 2001 and now updated and expanded, History of the American Guitar begins in New York City in the 1830s with the arrival of Christian Martin, from Germany, to set up the Martin company. From that historic moment, the book takes readers on a fascinating and comprehensive visual tour of U.S. guitar history. Over 75 brand names are represented, with more than 300 guitars photographed in stunning detail, including Bigsby, Danelectro, D’Angelico, D’Aquisto, Ditson, Dobro, Dyer, Epiphone, Fender, Gibson, Gretsch, James Trussart, Kay, Maccaferri, Martin, Micro-Frets, Mosrite, Oahu, Ovation, Regal, Rickenbacker, Stella, Stromberg, Suhr, Taylor, Vega, Washburn, Wilkanowski, and many more. The interrelated stories of the guitar, mandolin, and banjo are mixed seamlessly with the history of the diverse American music that grew and prospered with these instruments, from country to blues, from jazz to rock. Squier Showcase: Celebrating 30 Years! In 1982, Fender revived an old guitar-string name for its new line of Japanese-made electric guitars. 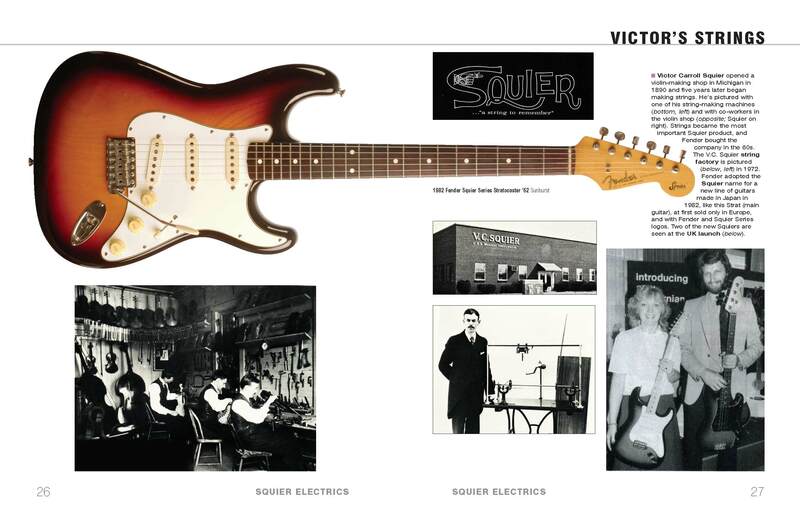 Thirty years and millions of guitars later, Squier is almost as important to the company as the main Fender brand. In celebration of the budget brand’s 30th anniversary, we’re showcasing some of Squier’s more experimental guitars, as featured in Backbeat’s own Squier Electrics: 30 Years of Fender’s Budget Guitar Brand. If you like what you see, please check out the full text here. Guitar pundit Tony Bacon reveals the stories behind the original (and collectible) Japanese-made Squier Series models, the way that Fender has often been more adventurous and experimental with Squier, away from its protected main brand, and the famous musicians who have chosen to play Squier instruments, from Courtney Love and her Venus model to blink-182’s Tom DeLonge and his one-pickup/one-control signature Stratocaster. 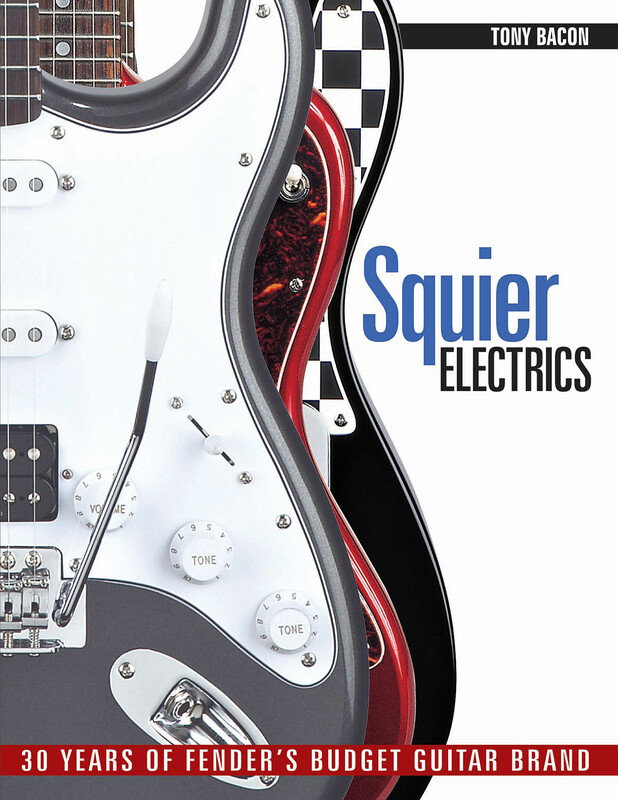 Full of the luscious pictures, absorbing narrative, and collector’s data that characterize Bacon’s best-selling instrument books, Squier Electrics is the only guide to one of the most popular guitar brands of recent times. Available for purchase here. TONY BACON is a leading author on instrument history and a co-founder of Jawbone Press. His books include Paul McCartney – Bassmaster, 60 Years Of Fender, The Ultimate Guitar Book, The Stratocaster Guitar Book, Electric Guitars – The Illustrated Encyclopedia, and many others.